I recently had the most wonderful experience as an artist in one of my favorite towns in California, Berkeley. 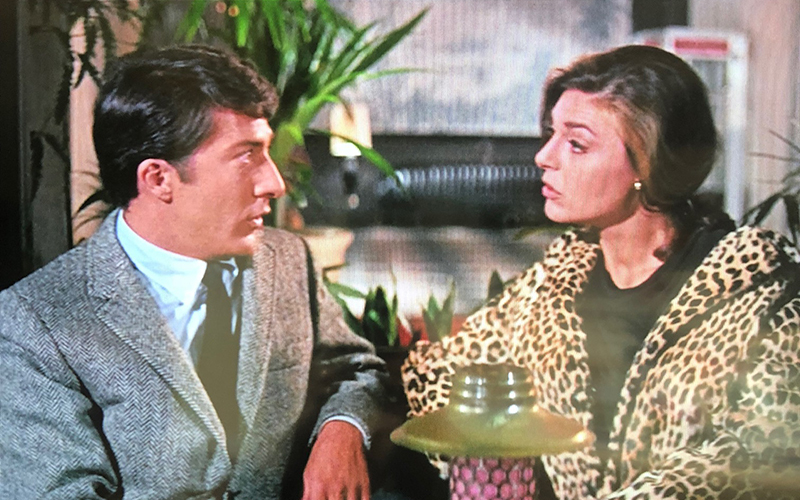 I discovered the charming boutique hotel, the Graduate, when moving my daughter into her dorm room at UC Berkeley this past fall. Not only is the hotel right next door to her dorms but it is incredibly charming and loaded with character! You know when you walk into a hotel and there is an Ashley Longshore painting in the entrance, you are in for an intriguing experience! 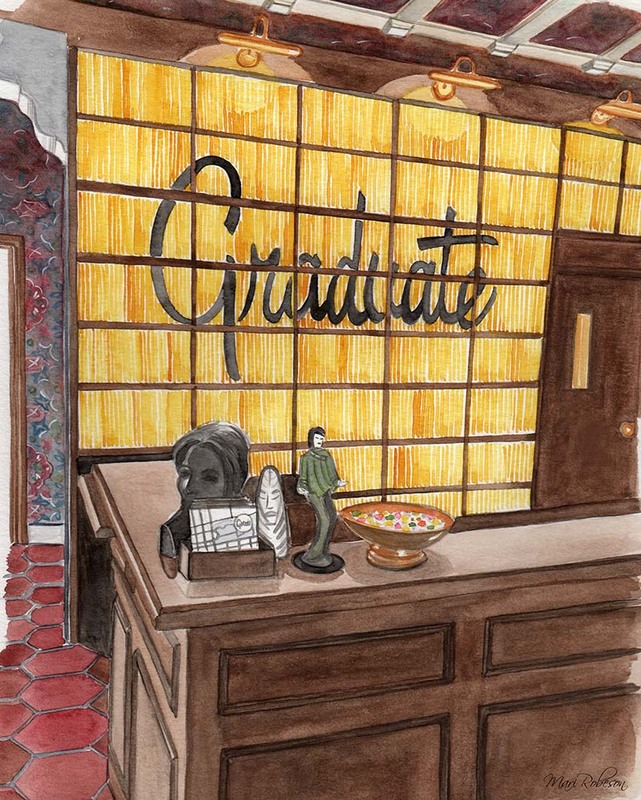 Once the Durant Hotel, now given new life as the Graduate Hotel, it is full of quirky college themed items based off of the 1968 movie The Graduate which takes place at UC Berkeley (although some of the scenes were actually filmed at USC - fun fact). The rooms are fully appointed with everything you need and the attention to college themed detail is impressive. I’ve been an Interior Designer for almost 15 years and I can honestly say this hotel is at the top of my list when it comes to clever design. As an artist, the design is incredibly inspiring as well. The mix of old world ikat rugs and houndstooth blankets, with original art and lamps that appear, a-hem…, ‘multi-functional’, one gets the impression that the person who stays here is well read and well traveled. When checking in to the hotel you at first don’t realize the the entire back wall behind the reception desk is actually hundreds of National Geographic magazines! Come on! Who thinks of this stuff?! I die! Of course there is a fun Bar & Grill next to the lobby I just had to do a quick sketch! Also in the lobby, they have the most adorable vintage bikes you can use. In Cal Bear colors of course! The campus of Berkeley is simply beautiful and loaded with history. Did you know there are 41 libraries on campus? So no excuses for not having a place to study. If it were me I would live at the historic Doe Memorial Library! It’s just so, so charming and cozy! As a proud parent of UC Berkeley student, I’m looking forward to many more visits there and discovering more of the wonderful attractions Berkeley has to offer. While staying at the amazing Graduate Hotel we also discovered some super places to eat and shop, but that’s a post for another time. We will definitely be going back to stay at the Graduate, Berkeley not only for it’s great location to everything but because the place is so warm and inviting, the staff is so kind, and it feels like home away from home…and it didn’t hurt to know that the urinal in the men’s bathroom is Stanford red… OK I may have taken a picture of that too! Champions! President's Cup Cal South! In between design projects and the daily tasks of life, did you know, I'm also a Soccer Mom? Like, for realzzz! I travel to crazy cities all over the place so my girls can play soccer. Well, this weekend, it payed off! Out of 64 teams in the Southern California territory, my daughter's team Won the Championship! 3 times my daughters have made it to the finals in State Cup so it must be true that the 3rd time is a charm, because today they WON! Coming from a small Coastal Town this is a big accomplishment! Great Coaching! Great Girls! Great Parents! Congratulation SLO Storm U15 Girls!!!! Back to design tomorrow but for today, I'm one very proud soccer mom! Welcome April! This month's Free Desktop Wallpaper is here! My Poppy design is for anyone who is striving to achieve their dreams! If you Believe You Can - You Will! Enjoy! If you share & I hope you do, please credit Mari Robeson. For personal use only. I'm currently in the process of making over many projects in my life, big & small. Including a new website, new catalog and also the interiors of parts of my home. We built our house ten or so years ago and it's time for an update! As I started to put together my ideas for *my* interior design project, a fun little spark of inspiration happened. As most of you know, I'm an illustrator too and I love, love, love that I can combine Interior Design with my passion for Graphics & Painting. That's how this Herme's Tray Print came about. These are the colors I'm wanting to incorporate into my new Living Room. What happenned next was really thrilling! After posting a quick pick on my Instagram I heard from many talented designers who wondered if I could do the same type of painting for them but with one of their designs...so let's just say for now that this is happening! (More on that soon!) So excited to share those collaborations with you! I was also really happy to see how many of you were interested in purchasing the prints! 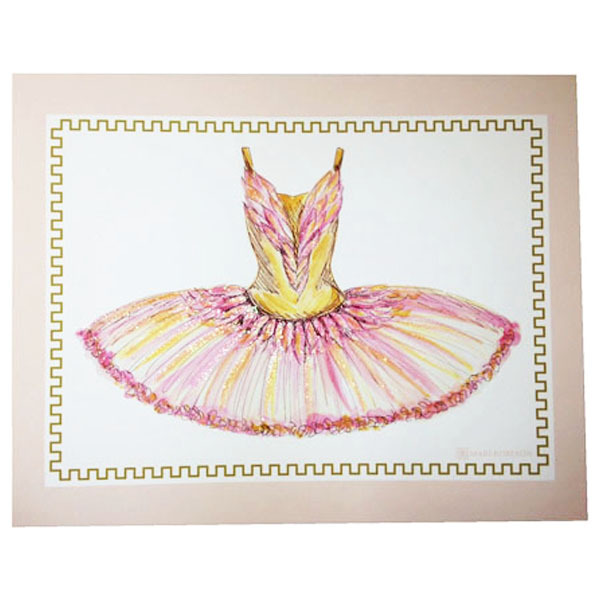 They are available in my shop and now I've also included notecards! There's so much to be thankful for this rainy Friday...most of all I'm Thankful for You! Make sure to check back in this weekend for my FREE March Desktop Wall Paper I designed for District17 & you! I think it's one of my absolute favorites!!! Free "Year Of The Horse Wallpaper" For You With Love From Horses & Heels & Me!! Happy New Year Everyone!!! I'm am so excited about 2014! I can't wait to share with you all the projects I've been working on!!! To start, let's talk about Raquel & her wonderful blog, Horses & Heels that has so many inspirational posts about everything equestrian! We met a month or so ago and I just loved everything she was creating. I had been thinking about offering a Free Desktop, iPhone, iPad wallpaper for each month in 2014 and (call it coincidence or not), Raquel had asked if I wanted to create one for her. 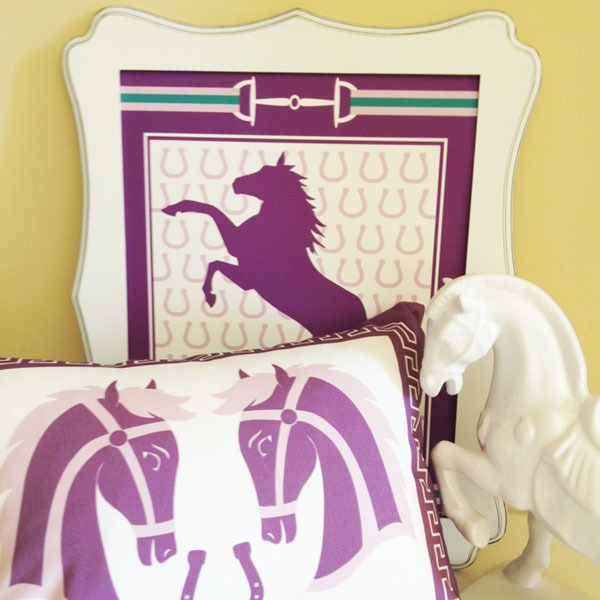 With the launch of my New Equestrian Collection, Pantone's Color Of The Year Radiant Orchid, & 2014 being the Year Of The Horse, the timing couldn't have been any more perfect! So head on over to Horses & Heels & enjoy these free graphics I designed just for Horses & Heels & YOU!!! Here are the links to the graphics you may use on your own personal devices. These images are Not for resale. If you choose to share on your site please credit back to myself & Horses & Heels. Thank You & Happy New Year!